If your tenants are asking for an app to pay rent online or submit maintenance requests, it might be time to stop brushing aside their requests. With 56% of the renter population made of the Millennial generation, and with a renter population of over 100 million, it’s safe to say we can look at Millennial trends and preferences to understand the best way for landlords and managers to connect with their tenants. Millennials are so attached to modern technology, that 84% claim they sleep with their smartphone, claims Nielsen Research. In the same report, Nielsen Research found that more than 74 percent [of Millennials] feel that new technology makes their lives easier. And renter technology is no different. It’s designed to make their lives easier. (Like so easy, they don’t even have to leave the comfort of their home to pay rent!). Your renters have found a way to do everything online, from ordering delivery food or a taxi service to sharing music or checking their power usage. It’s no wonder that they spend 90 hours per month spent on smartphone apps alone, according to the The 2016 U.S. Mobile App Report from comScore. So how does a landlord give into the demand of his renters who need and want an app to do their renting online? Simple- give them access to a tenant portal. 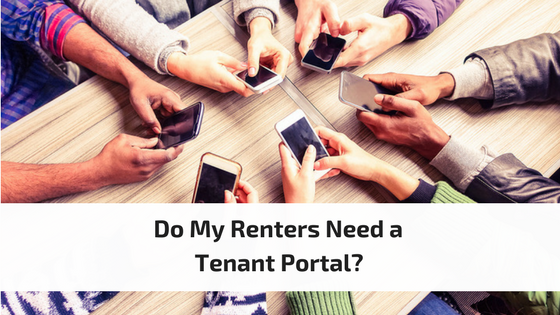 Tenant Portals are not some misty hole that brings your renter into a realm of lavish apartment amenities and rent-free living, but rather an online account for your renter to submit maintenance requests, receive notices, and pay rent. 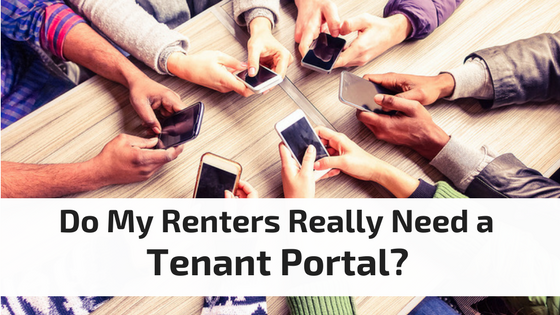 Where do I find a Tenant Portal? Most property management software programs will provide you with a Tenant Portal to meet your renter needs. 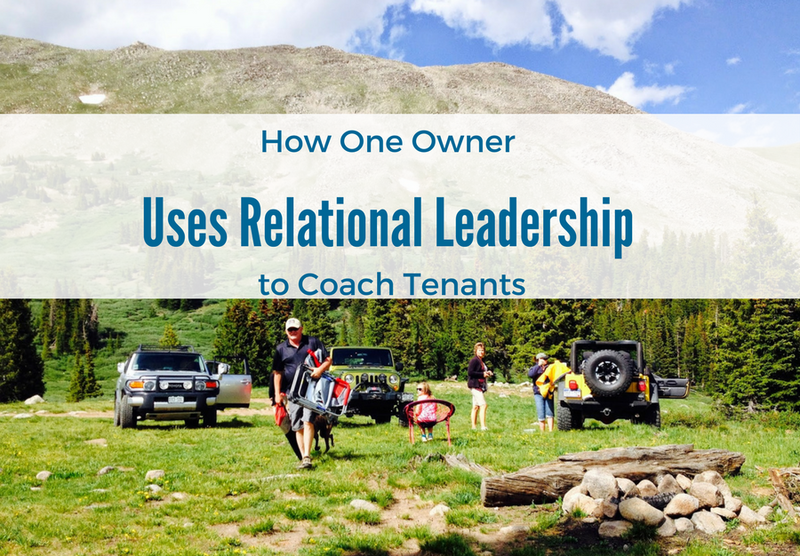 The best rental software companies want to give their clients the best services to offer their tenants and will include a feature rich Tenant Portal along with the other must-have rental management features. How Does a Tenant Portal Work? Using a smartphone, tablet, or computer, your tenants can log into their account using their own username and password to monitor their rent payments, submit work orders, and receive direct communication about their rental. Additionally, tenants can review their statements, and make minor setting changes, such as email address updates and email receipt preferences. The added convenience of providing your tenants with a Tenant Portal, means happy tenants and less vacancies. Renters can check on past payments and see when their next rent payment is due. They will be able to see any late payment notices right on the homepage of their account. Renters can set up one time or automatic rent payments via bank transfer or pay with a credit or debit card. Autopay will reduce instances of late fees for your renters and help you get paid on time. Renters can submit a maintenance request directly from a Tenant Portal. 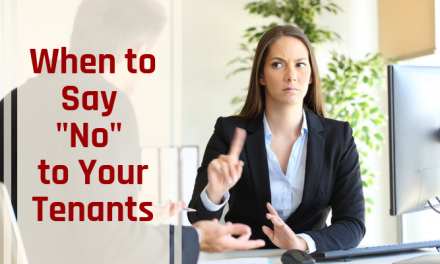 Providing a convenient way for your tenants to report a problem means a tenant is more likely to be proactive in communicating issues to you. This could mean huge saving to you by preventing a problem from going unreported and causing unnecessary damage to your property. Notify your renters with information about the property, they will be able to view directly in their portal. Tenants can also update their email address and select which type of notices they would like to receive. With more and more people embracing mobile communication, emails are serving as a direct link between you and your tenant. You can upload files to share with your renters in their Portal. Items some landlords choose to share with their tenants include a copy of your lease agreement, move-out requirements, and contact information. File sharing allows your tenant to access important information without hassling you directly. If you already use a property management software, check to see if they have a Tenant Portal for you to provide your renters. If you have yet to select a software solution to streamline your rental business and enter the simplified era of online rental management, it’s time to find one to make your life and your renters’ lives easier. PreviousWhat is Cash for Keys for Rental Properties?